The supposed Curse of Tutankhamen has somewhat overshadowed the astonishing discoveries of Howard Carter, the British archaeologist and Egyptologist. A trio of 1930s letters by Howard Carter, who discovered Tutankhamen's tomb, sold for a total of £5700 in a Trevanion & Dean auction. In 1922 he found the sealed tomb of the ancient Egyptian pharaoh, but the media especially took a keen interest in the 'curse' that first struck a year later when Carter's sponsor Lord Carnarvon got bitten on the cheek by a mosquito, accidentally made the bite worse while shaving, and died in a delirious fever. 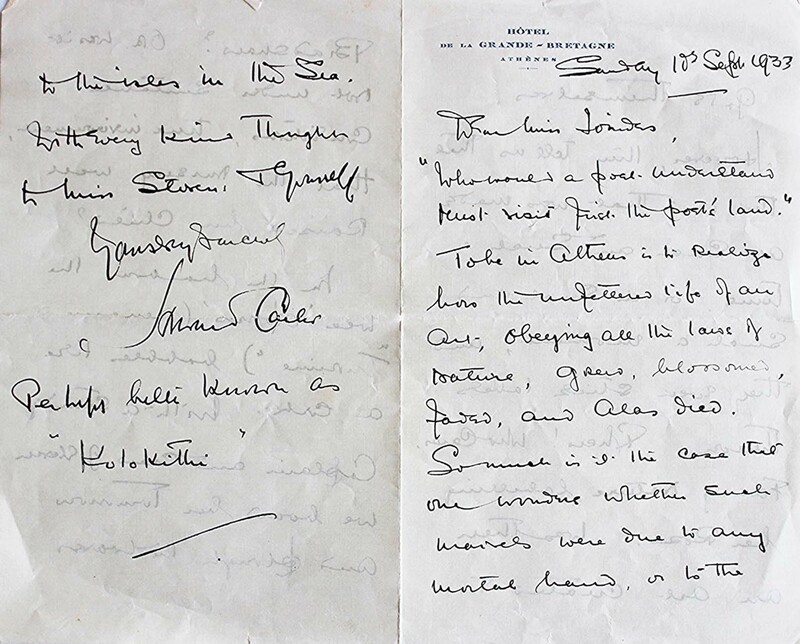 Before long the deaths of anyone remotely connected to the discovery were linked to the boy-king's revenge – something that clearly rankled with Carter, as a trio of his letters sold at a Shropshire auction house on June 16 underlines. Consigned by a Welsh Borders vendor to Trevanion & Dean's specialist historical documents and book auction, the letters that date towards the end of his career in the 1930s provide an insight into this period of his work and reflections on colleagues he worked with. The letters instigated a fierce international bidding battle, before finally selling to UK buyers for a total of £5700. Sherlock Holmes author Arthur Conan Doyle, a strong believer in the supernatural, had said Lord Carnarvon's demise must be the 'curse' of the mummy and newspapers followed suit. Best-selling novelist Marie Corelli's speculations that "the most dire punishment follows any rash intruder into a sealed tomb" also appeared in UK and US newspapers. However, in the highest-selling letter at £3000 (estimate £400-600) from 1934, Carter places the blame elsewhere. The handwritten message on Gurna Luxor Egypt headed paper, dated January 21, 1934, starts off: "Dear Miss Ionides." Having just written "The death of the Duchess of Alba was very sad", Carter then says: "I fear I must admit that I have not the same sentiments with regard to Weigall [Arthur Weigall – Egyptologist and newspaper reporter]. In fact death is a real blessing. For although he was a clever writer he was cunning. His inventions had no basis and thus a menace to archaeology. Those of them for temporary excitement and amusement at the expense of others. "The 'Tut... ? Curse' was his invention. Believed out of pique - a sour language - towards his loyal friend Lord Carnarvon, who, because Weigall came out solely as correspondent of the Daily Mail, was obliged to treat him like the other newspaper correspondents. He was never at the opening of the discovery. He was the last of the correspondents to arrive several minutes afterwards." Lord Carnarvon had sold exclusive rights on the story to The Times. This involved a £5000 contract, plus 75% of all profits from the sale of Times articles to the rest of the world. According to a rather more recent article in The Guardian ahead of a 2014 exhibition about Carter and the discovery of Tutankhamen at Oxford's Ashmolean Museum: "The media in the 1920s found plenty of evidence that something was punishing the excavators of the most perfect ancient Egyptian burial chamber ever found. "Lord Carnarvon's pet bird was eaten by a snake, his dog died back in England almost the exact moment he kicked the bucket in Egypt, and a radiologist who supposedly x-rayed the mummy died of a mysterious illness. A rich American died of pneumonia after visiting the tomb, and a member of Carter's excavation team was said to have died of arsenic poisoning." But as the newspaper also pointed out: "If Tutankhamen wanted revenge, why spare Howard Carter, the man who actually found him and lived to tell the tale? The expedition mortality rate was no higher than you'd expect among the imperial British at the time." 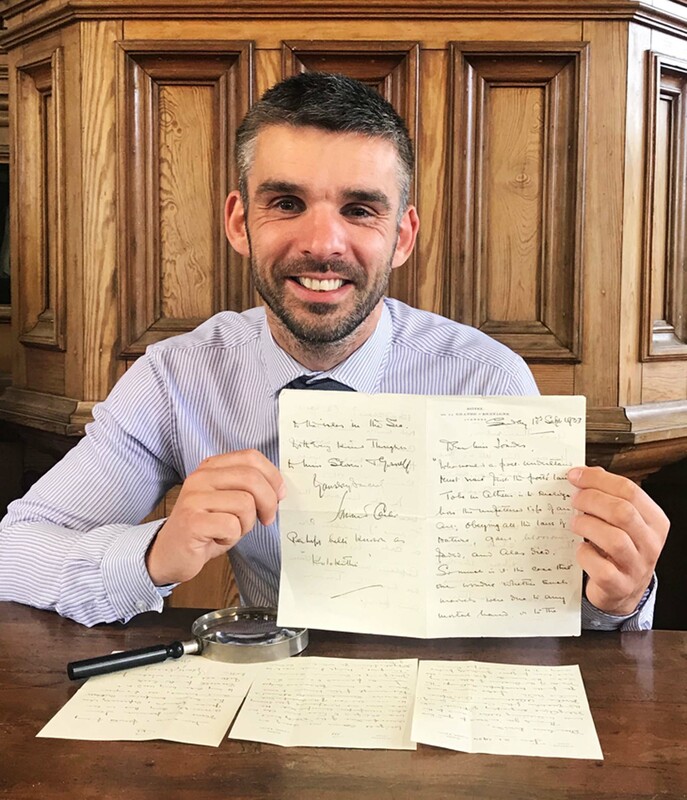 Trevanion & Dean auctioneer Aaron Dean with a trio of 1930s letters by Howard Carter, who discovered Tutankhamen's tomb, which sold for a total of £5700. Trevanion & Dean auctioneer Aaron Dean said: "Carter arrived in Egypt in 1891 and began excavating in the Valley of the Kings. At the time most experts believed all the royal tombs had already been found and artefacts of any significance had been removed. But Carter methodically mapped the area and was determined to continue, despite intense scrutiny, criticism and constant funding issues, he persevered against the odds and discovered Tutankhamen's tomb in 1922, the very last of the tombs in the Valley of the Kings to be found." Over the years, Carter meticulously described, photographed and sketched more than 5000 artefacts crammed from floor to ceiling in the interior rooms of the tomb, which included statues, jewellery, furniture, clothing, weapons, and even chariots. Tutankhamen was only a child when he ascended the throne in 1333BC and ruled for only a decade. Although he was not one of the most influential of Egyptian rulers, the treasures found in his tomb provided more evidence of the culture and history of ancient Egypt than had every been previously discovered. Most of the Valley of the Kings tombs had been ransacked from early times and Tutankhamen's was the first to be found almost entirely undisturbed.